First Night is actually an arts festival. Boston is known as the Hub Of The Universe due to its longstanding support of the arts. Hundreds of thousands of people visit the city for this outdoor jubilee. Excitement builds during the month of December each holiday season. 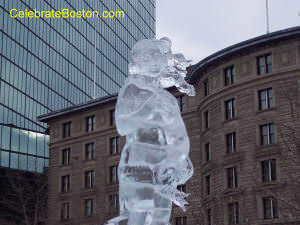 The Christmas Tree is lit at Prudential Center, skaters are gliding around the Frog Pond, Faneuil Hall Marketplace is decorated with Christmas lights, and beautiful ice sculptures adorn Boston Common and Copley Square. First Night takes place on December 31st, New Year’s Eve. Attendees purchase an official pin-back button, which is the equivalent of a ticket, for the festival. The button is also a discount pass, with businesses offering benefits both before and after New Year's. First Night includes numerous indoor and outdoor activities, exhibits, and performances, for people of all ages. Artistic events take place in the Back Bay district, on Boston Common, and along the waterfront. Most of the cultural icons of the city participate in First Night. The Museum of Fine Arts, Institute of Contemporary Art, New England Aquarium, and Boston Public Library present special exhibits for First Night. The Hynes Convention Center is a major venue each year, with many rooms in the auditorium filled with family entertainment. The range of works displayed during First Night is incredible. There may be a children’s chorus singing Christmas carols; a percussionist at the Hynes; short films or exhibits at the MFA; a Shakespeare performance at a local theater; a concert at Copley Square or the Common; jugglers or unicyclists presented during the grand procession; diverse dance performances at various venues; a string quartet at a hall or other local attraction; or even kids activities such as face painting or holiday puppet shows. The First Night Grand Finale takes place at midnight. There are countdowns at Copley Square, Boston Common, and Rowe’s Wharf along the waterfront. A huge fireworks display above Boston Harbor caps this festive evening, which greets the new year with a joyful bang! A Helpful Tips page is available on CelebrateBoston.